Clifford Harris Jr. first came into my life in 2003. One of my friends talked about him constantly, so when we heard he would be performing in Tallahassee we made our way to see him. This was my introduction to T.I.P. better known as T.I. and I have been a fan every since. In him I have always seen a person who is good at heart but who often falters in his decision-making. He is no angel nor would he be considered a saint but neither am I.
T.I.’s troubles with the law and multiple incarcerations have become fodder for the media. Recently I have heard several discussions regarding his release from prison and it seems as though his fate has been pre-determined –“He’s just going right back to jail;” “I hope he doesn’t make a song about forgiveness AGAIN.” At first I shrugged it off but then I became appalled at the number of people who chose to publicly and privately speak “death” upon him instead of life. It was as if people forgot about their own transgressions just long enough to cast stones at him. I am not a T.I. fanatic but I found myself defending him as if he were my own brother. Wait! He is my brother! No matter how many times my biological brother found himself behind those iron clad bars he was always welcomed home. We didn’t place bets on how long he would stay out or stress his spirit with our disbelief in him. We prayed that God would deliver him and that he would “straighten up.” We saw the good in him along with those areas he really needed to change. We didn’t condemn him because we knew that if we looked hard enough each one of us had something that we repeatedly had done; yet we asked and expected our Father to welcome us back to Him every time. Often we find ourselves discussing the business of family, friends and co-workers and readily speak “death” upon them with our doubts and nay sayings. Instead of welcoming them home, we anxiously await their next mess up. With so many doubters, detractors and fake supporters, I understand why it’s so easy to fall prey to bad vices. This Empowermoment isn’t about T.I. as much as it is about allowing people to redeem themselves and embracing them when they seek to do the right thing, even if it’s their seventh time. This doesn’t mean that we should purposely sin; but we all do things some times that aren’t pleasing to God. No matter how many times we fall, the important thing is that we can get back up and come home to Jesus…Again. Thank You for embracing me with open arms EVERY time I fall. Thank You for encouraging and not discouraging when I fall prey to temptation. Help me to be the same way with my fellow brethren. Bridle my tongue when I have it in my mind to speak “death” upon someone’s life. Help me to forgive and move forward just as You do time and time again with me. In Jesus Name, Amen! Today I EMPOWER you to speak Life. Speak LIFE into your family, your friends, your finances, your marriage, your household, your job and your spirit. If in some way you fail, repent and know that you can always Come Home, Again! Next postWhere “Dem” Dollars At?! Amen, Amen and Amen!!!! Thank you SO much for this word today my Sister! I am definitely going to start ASAP speaking LIFE into all the areas of my life that I want to improve/change. God bless you and keep you!! Dee, God bless you and I challenge you today to start speaking life!!! As I write this I am convicted of the many ways that I speak against my own self when things don’t seem to go my way so this is a lesson for me to change as well. Seriously though, I LOVE this for some many reasons. 1) Cuz I love TI (2) Cuz I understand how it feels for someone just to count you out based on your past and (3) Cuz I too have counted people out a few times based on their past. I am so glad God doesnt do us like that. Thanks Chancee`! Girl Stop! Do you need a fan? LOL! I think that we are all guilty of judging others on their past actions but imagine not being able to get ahead because people talked about dimebone :D. It would be a travesty. I know that I too am guilty of speaking “death” and not having faith in others. It is acknowledged and I am continuously working on it and I encourage you to do the same. I love this EmpowerMoment! it is speaking to me, and telling me to SPEAK LIFE! So on time!!! Thanks girlie! I am glad that you enjoyed it. So very necessary to understand we are not the ones to judge, but yet it is so easy. Forgiveness is no joke, and not easy. Family members are often the ones (even us) that find it hard to forget a person’s past. I guess we are all a work in progress. Very really relevant message Chancee! Awesome picture, I mean, post, lol. Kay I am glad that you liked my pic errr I mean post too. 🙂 No lie sometimes I find myself talking about a person based on what I knew of them in high school. Really??!! That was sooo many years ago and so not relevant to the present. My yesterday isn’t even relevant to where I am going. Continue to speak LIFE! 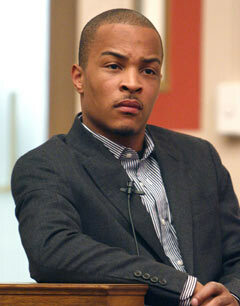 Ok I’m a T.I. fan too :-)…In his track “Get back up” he writes “the good I did in your hood should it overshadow that?” I love that line because often we highlight a persons faults/failures and dismiss the positive things they’ve done. Like Kay said, it’s easy to do. With my work, I try to remember that the worst thing that a person has done is not the only thing that they have done. Tasha Tasha Tasha….. I love that song! We dismiss what people do so often as soon as they make a mistake. Our faults don’t cancel out the good that we have done. I am looking forward to more from T.I. Wearing my Free T.I.P. shirt with Krissy. LOL! And for that, you would be my lawyer………..well, if my Hubby hadn’t decided to be one, but you know what I mean, lol. Thanks Amber. I am glad that you enjoyed it. LOVED it!!! So often I have to catch myself from claiming broke but rather in between financial blessings!!!! Lord knows that it is the truth because even when I don;t know what is next it has already been worked out! Thanks for sharing! Oooo honey!!! This is a great way to look at this post. I think this is the area where I find myself speaking death the most. What I have, don’t have and am not going to be able to do!! As a colleague once told me…”I am between blessings.” No I may not have what I would prefer but I will speak life into my circumstances until I can see what I already believe. I am so claiming that as well….”not broke; just between financial blessings! !” LOVE IT AND CLAIMING IT!!!!! God bless you Sister!! Thanks Chaunte! I am glad that you enjoyed it.